The holidays are quickly approaching and with it appears all sorts of cute little decorations! Christmas trees, twinkling lights, little villages, and nativities appear in every spare spot. The air is abuzz with the sound of laughter and music. Delicious smells waft through the house. Presents are wrapped and placed under the tree. The excitement of the holidays is everywhere! It’s a magical time, but let’s face it – the kids are wired from all the excitement! If you’re wracking your brain for something to occupy them for a while, then Hang’em & Hatch’em Eggs may be just the thing for you! 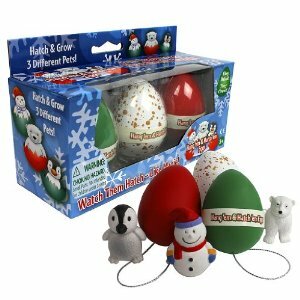 They come in a cute little three pack of colorful eggs that you can hang on your tree for however long you would like, and then hatch in a bowl full of water. Out come three cute little critters: a penguin, a polar bear, and a snowman. When I pulled the box out, my two kids went nuts! Within seconds they had decided who would get which one and where they would put it and what they would name it. And being the sudo-nerd that I am, I try to turn everything into a learning opportunity, so we hatched them together as a family project. First, we read the directions. Because lesson number one is: follow the directions! There are four simple steps. Step 1) Put the egg in room temperature water up to the top of the egg. We have learned from past hatchings that the warm water is key. Too cold and it won’t hatch. Too hot and it hatches too fast! (A nice lesson on how things dissolve too.) Step 2) After a day or two the eggs start to hatch. Over the next couple days, the pet will grow out of its shell. (Our first one started to hatch within 24 hours, and all three by 48 hours, but it was a few days before they fully emerged. A great lesson in patience!) Step 3) Change out the water every day to help your pet hatch & grow. (Don’t skip this step. The water gets pretty nasty quick!) Step 4) Once hatched you can keep your pet in water for up to 3 weeks (and see how big it grows) or take it out and play with it. (In our house, the four days it took to watch them hatch was long enough…they were played with right away!) As they dry out, the pets will shrink back to their original size, eventually be dry and hard (another great lesson about evaporation) but can be grown again in water. My kids loved these little guys. Of course they didn’t make it to the Christmas tree in our house (the kids couldn’t wait to get into the package! ), but they would make a great stocking stuffer!